Fifth in a multi-part series AT THE MILL. the non-GMO fish about twice as long. Photo courtesy of AquaBounty. 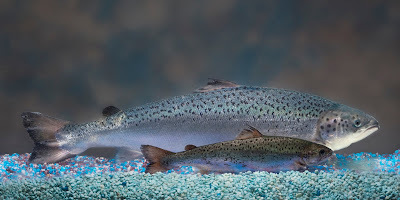 A new innovation in salmon aquaculture has started to reach market - genetically engineered Atlantic salmon that reach harvest size at 16-20 months instead of 28-32 months for aquaculture of unmodified salmon. The fish are brand named AquAdvantage®. 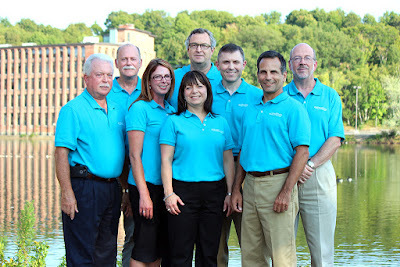 The company is AquaBounty Technologies, Inc. 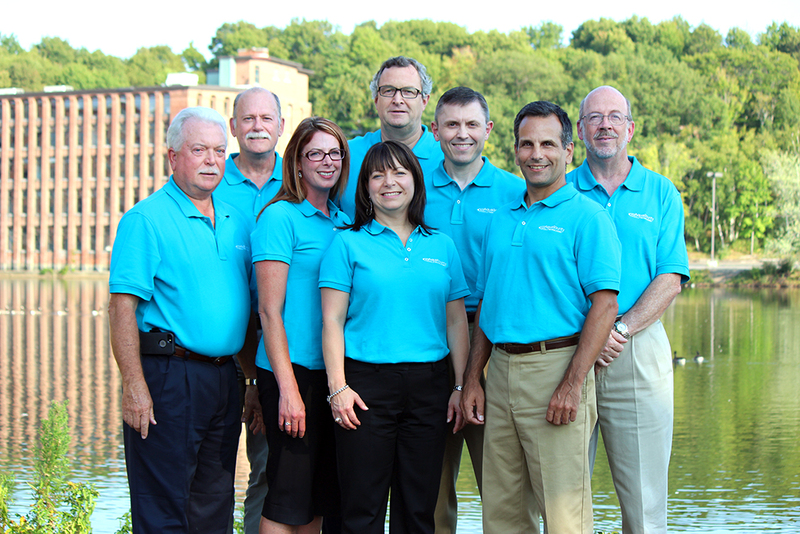 The company’s headquarters is officially located at Mill & Main, Maynard, Massachusetts. This does not mean that there are tanks of giant fish lurking in the basements of the mill buildings, striving to escape into the Assabet River. Point of fact, there are no salmon in Maynard whatsoever. Never have been. Never will be. Most day-to-day operations, research and production take place in other locations. Only three staff are actually situated in Maynard. Photo courtesy of AquaBounty. Click on photos to enlarge. The life cycle of the Atlantic salmon varies, from one to four years as a small fish in a fresh water river, followed by two to four years in the ocean before returning to the same river to spawn. Unlike some Pacific salmon, the Atlantic species can return to the ocean after spawning and then back to the river in a year or two. 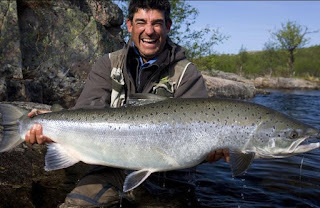 Adult salmon are on the order of 30 inches long and weigh about twelve pounds, although potentially much larger if they delay returning to spawn for a first time or are repeaters. Trophy-size fish can top 50 pounds. Survival research suggests that it takes about 8,000 eggs to end up with two sexually mature fish. Due to over-fishing and destruction of riverine habitat, there is no longer much in the way of a natural commercial catch. Instead, salmon fish farming - aquaculture - uses fresh water tanks for the first year and then massive cages in the ocean to raise salmon to maturity – from egg to harvest – in 2.5 to 3.0 years. For Atlantic salmon (but not for various Pacific species), a point has been reached wherein less than 10 percent of the market is wild-caught. What AquaBounty did was transfer a gene from Chinook salmon and a promoter sequence from another gene, from ocean pout, into Atlantic salmon in order to continually produce growth hormone rather than seasonally, as in wild fish. Several systems are in place to prevent accidental escape of GMO salmon to potentially breed with or out-compete wild salmon. First, the fish being raised for market are sterile females. The fertilized eggs from the breeding females have no male chromosome, and an egg treatment causes the hatched female fish to be sterile. The breeding facilities have physical and chemical barriers to prevent physical escape, and the locations for raising marketable fish (Panama, and soon, Indiana) have no connection to the ocean. In theory, a fish raising facility could be created in Maynard (big fish in the mill pond, anyone? ), but that’s not going to happen. before returning to the river to spawn. Internet photo. Advantages for salmon aquaculture in land-based tanks versus ocean cages – true for GMO or unmodified fish - include better food-to-weight gain efficiency, lower risk of diseases, less predator loss and a lower transportation carbon footprint. The method of inserting these particular genes into Atlantic salmon was finalized more than 25 years ago. All the intervening time has been getting government approvals to produce and market the fish, which has taken far longer than any GMO plant approval. The very first batch actually brought to market was to Canada, in June 2017. Looking into the future, one might expect to see a fish store display with three trays: wild salmon, farmed salmon, GMO farmed salmon. Priced accordingly. Consumer’s choice, just as it now is with organic versus non-organic. Disclosing that I own shares in AquaBounty. And am willing to eat GMO fish.